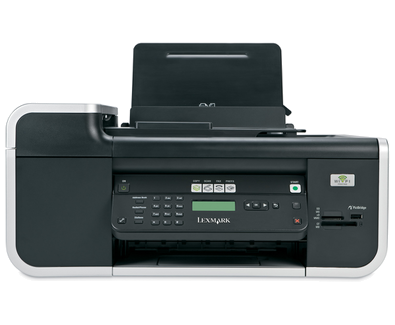 Enjoy professional productivity at home with the Lexmark X6690! Experience the convenience of built-in 802.11b/g wireless connectivity, coupled with fast print speeds, lab-quality, photo printing, 1-touch copies and full feature fax with 25-page automatic document feeder! Lexmark Toolbar, with Picnik™ photo editing and Scheduled Print, makes Internet printing easy! (3) Printing in draft mode and excludes time to first page print. (2) Non-refillable cartridge licensed for single use only. Return empty cartridge only to Lexmark for remanufacturing, refilling or recycling. A variable amount of ink remains when this cartridge must be replaced. Replacement cartridges (4A, 5A) sold without those terms are available through www.lexmark.com. All prices, features, specifications and claims are subject to change without notice. (1) Printer designed to utilize your network's security (WEP, WPA and WPA2) and broadcast range. Access to electricity is required. Built-in 802.11b/g wireless printing. Compatible with 802.11n. Use Lexmark genuine supplies for best results! Box contents may vary by country and/or reseller. Subject to change without notice. Check product container for actual contents. A4, L, Letter, 2L, 4" x 6", B5, 89 x 127 mm, 13 x 18 cm, Legal, A6, Hagaki 카드, 10 x 15 cm, 4" x 8", 10 x 20 cm, A5, 5" x 7"
인치 - H x W x D): 13.1 x 18.3 x 19.7 in.